In Summary: We are in Numbers 34, and we are looking at the division of the land among the people of Israel. They are reaching the end of the Wilderness Wanderings, and soon will move into the land. We will revisit all of this in Deuteronomy, because that book reruns the Exodus story. And yes, I will strive to blog through that without dead-repeating everything I’ve done. But that’s a few weeks out. Here we have some place names that are clear in history, but others that are not so well known. The same is true of the people mentioned: Caleb comes up again, but Bukki son of Jogli is a one-hit wonder of Scripture. In Focus: Take a look at the map in your Bible (or below, from Logos Bible Software). The borders limit the spread of Israel. The only one that was truly forced by a natural feature was the Western Border at the Mediterranean Sea. The others are based on the extent of the land God had promised. These borders mark the land, and the land is what God has promised the people. The blessings and cursings on Mount Ebal in Deuteronomy reflect on being permitted to stay in this land. In Practice: Practically speaking, borders are valuable. There are the physical/literal borders that separate nations. These are supposed to help keep people safe from intrusion, but that line is rapidly being erased. Just ask Texans and Ukrainians. There is also a symbolic idea here. There are borders that delimit the area for God’s people in Numbers. On one side of the line, they are living in God’s blessing. The other side of the line is either the point of rejecting God’s promises or suffering God’s punishment. We need to be aware of the borders in our life. We have a great freedom in following Christ, yet there are still borders that are defined by God’s Word that we must remain in. This is true whether we are looking at a church’s behavior, a minister’s behavior, or a person’s behavior. I believe there are also implications for the behaviors of nations and cultures, even those which do not align themselves with God’s Word in the first place. Churches, for example, have directions in Scripture. While a specific music style is not demanded, speaking to one another in song is commanded. So too with leadership qualifications. Christians have borders on life: is what we are doing loving God with all our heart? Is it loving our neighbors? Ministers? If we serve the God who is the Truth, we must be people of the truth. In all things, including how we represent ourselves. Nations? Cultures? Those who celebrate the opposite of obedience will see the opposite of blessing. 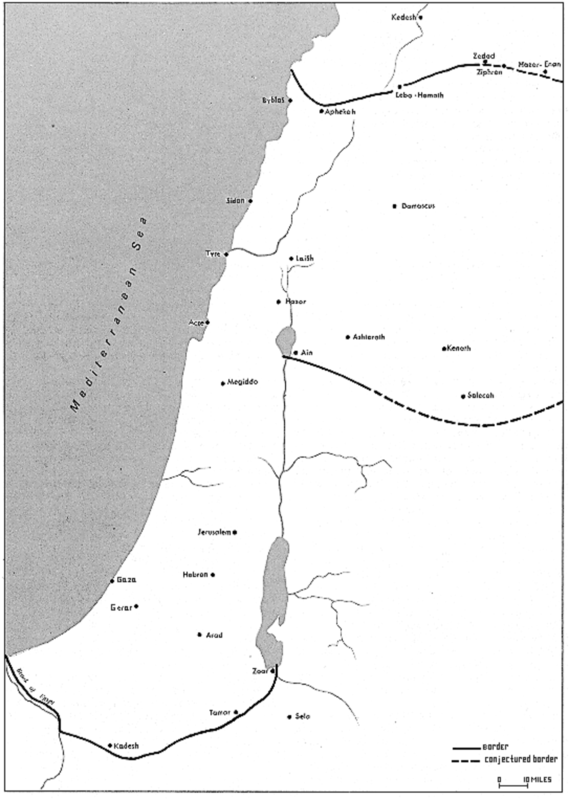 Does the granting of the land on the eastern side of the Jordan to Reuben, Gad, and the half-tribe of Manasseh (the other half of Manasseh crossed the river) expand the future promise to Israel? Or is it a temporary expansion of God’s promise of land and a future Israel should not expect that land? I don’t really have an answer there, but I think it’s worth considering that all the land promised to Abraham was Canaan on the west side of the Jordan.